SCP-2536 upon manifestation in Site-09 break room. Special Containment Procedures: As the nature of SCP-2536 makes physical containment impossible, containment procedures will instead focus on the manner in which personnel should conduct themselves in the event of a manifestation. To enforce this, as of 12/23/19██, copies of these containment procedures are to be distributed among all personnel currently in the employ of the SCP Foundation during the month of December. In the event that SCP-2536 appears before a member of personnel, they are to refrain from accepting any offered gifts, leave the vicinity of SCP-2536 and immediately inform their supervisor. Gifts presented to personnel by SCP-2536 are only to be accepted under strict testing conditions and after testing are to be confiscated immediately. 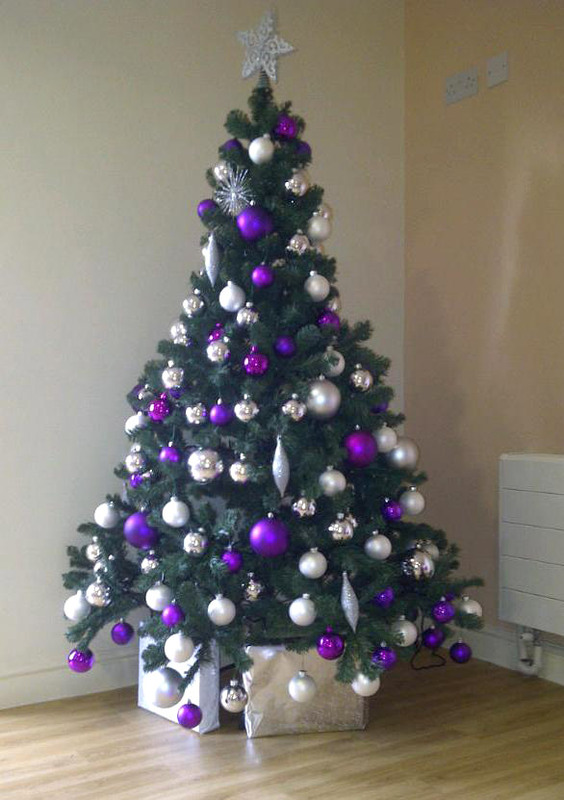 Description: SCP-2536 is a Christmas tree with purple and white decorations, approximately two meters tall and composed primarily of plastic. A speaker is attached to the base of SCP-2536, which loudly plays the song 'I Wish It Could Be Christmas Everyday' by the band Wizzard on a constant loop. SCP-2536 only manifests during the month of December, and its status during the rest of the year is currently unknown. During the month of December, SCP-2536 will appear before at least six members of Foundation personnel, one at a time, regardless of distance between them. No reports have been found from the public or elements outside the Foundation indicating SCP-2536 appearing to anyone apart from Foundation personnel. Upon appearance before a member of personnel, a gift in the form of a wrapped present consistent with traditional Christmas practices will be located beneath SCP-2536. This gift, hereafter referred to as SCP-2536-1, will contain an item which the chosen member of personnel greatly desires, whether consciously or subconsciously. In cases where the desired item would be too large to feasibly fit inside SCP-2536-1, its interior dimensions become significantly larger than its exterior ones. If the targeted member of personnel ignores SCP-2536, and leaves the area, SCP-2536 will disappear after three to five minutes. Here at [DATA EXPUNGED],1 we love nothing more than to watch the good work you fellows do. Your empathy and moral integrity are an inspiration to us all! And so, in this season of giving, we have decided to present you brave heroes who do so much for us with a gift of your own! Enjoy. Site Director Leder Materials required to shut down and subdue SCP-████. Dr. Landis Several excited Welsh Corgi puppies. DNA analysis revealed the puppies were all genetically identical. D-25372 A middle-aged woman and a pre-adolescent boy, later identified as D-25372's wife and son. After a brief interview and dosage of Class-A amnestics, they were returned to their home without incident. Dr. Ryans A copy of this file and containment procedures relating to SCP-2536. Note that this incident took place before 12/23/19██, and Dr. Ryans was thus unaware of the nature of SCP-2536 upon its manifestation. New containment procedures were implemented as a result of this incident. Agent Raleigh Unknown. According to recovered footage from the area, SCP-2536 manifested while Agent Raleigh was infiltrating a suspected location of Marshall, Carter and Dark activity, thus revealing his location to them. Agent Raleigh's current status and location are unknown. On 12/29/20██, at Site-09, SCP-2536 appeared before D-39122 and several other D-Class personnel outside of testing hours. Before security could intervene, D-39122 received several anomalous weapons2 from SCP-2536-1, distributed them among nearby D-Class personnel, and attempted an armed escape. Although this revolt was quickly put down by on-site security, hostilities resulted in several Euclid and Keter-level containment breaches, necessitating Site-wide lock-down and causing significant personnel casualties. On 12/██/20██, at Site-11, during testing of SCP-████, SCP-2536 appeared before it. SCP-████ retrieved a small device from SCP-2536-1 consistent in appearance with its own native technology. Upon activating the device, SCP-████ disappeared completely from Site-11 and is now believed to have transported itself to an as-of-yet unknown location on the planet. It is now confirmed that SCP-2536 considers objects and entities under containment by the Foundation to be Foundation personnel. 1. Note that no information has actually been removed from this note, and that this is the original wording of the message. 2. Weapons showed the capacity to disintegrate security personnel upon direct hits, or cause spatial warping inside their bodies upon glancing blows.